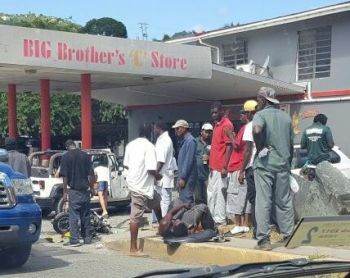 The accident took place in the vicinity of the Big Brother's Gas Station in Baughers Bay, on the main island of Tortola, just after 12:00 P.M. today, January 17, 2017. It is not clear how the rider of the motor scooter lost control of his machine. The young male rider appeared to be conscious as persons rushed to his assistance. Police and ambulance were yet to arrive at the time of publication. 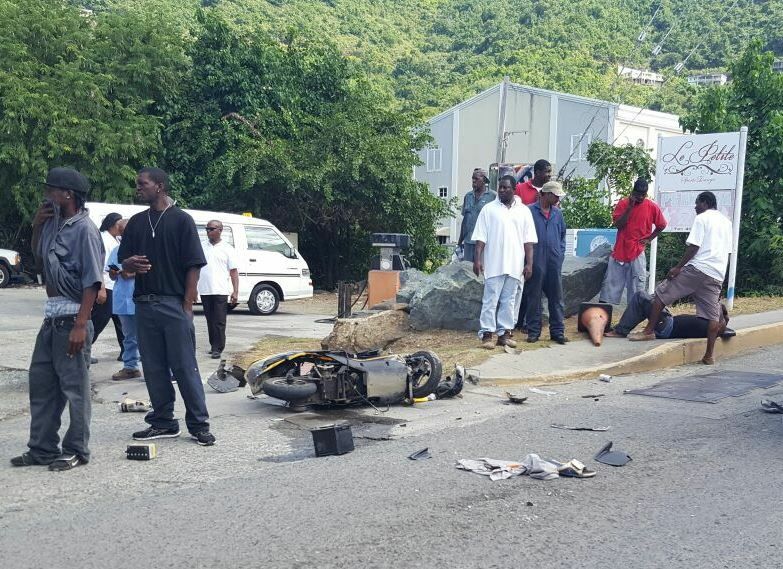 Kyle Frank, said to be in his mid 20s, of Purcell Estate, died in a motor scooter accident near the Treasure Isle Hotel just before midnight on January 16, 2017. These guys will never learn. Have they no sense?? Let us hear what happened before we presumed the scooter rider is fault. One fool passed me 10 minutes ago driving with one hand a can of drink in the other and no helmet. It is getting to a hilt where we are getting desensitized to these situations with scooters , and that worries me. Another life gone, someone's son, and these riders still have the attitude that it can't happen to them. Now another accident. , Accidents happen to everyone. So be safe, follow the rules and hopefully we can coexist peaceably on the road together . @bann um Let put your comment in order Parents, the rider him/her self, Government and Police. The problem is not the scooter it is the people who ride them. Sure they are......they are watching the lawless scooters fly by while they ticket forklift drivers doing 5 mph. Young people are not listening! Mother talk, father talk, aunt, uncle, brother, sister, cousin talk and when anything happens, who has to go. They are up and down driving WITHOUT HELMETS. Sickening man. Wether the scooter rider's are on the right lane and wearing a helmet or even two.once their scooter in not licence and insured they are wrong to be on the public road. They should also have a motor cycle licence also. Majority of these bikes are not licence and insured and any accident they are involved in they would always be wrong. Please law enforcers get these unlicensed and unsured scooters off the road. When they hit the licenced and insured trucks and cars is serous problems. The police commissioner now and those before keep talking about shortage of man power. Get these bunch of lazy people that you have sitting behind computers and behind desk shuffling papers pretending to be doing something. Put them on the streets for a few hours. Is the bvi different from any other Caribbean country . All those other islands you see senior officers walking the streets especially the town's. Mr commissioner tell me when last your senior officers walk through Road Town on duty.You mean to tell me that they have so much to Do? Please asked them to manage from in front and not from behind. Send them to patrol sometimes not only to meet and greet but to do actual police work. When last anyone heard a superintendent or commissioner take someone to court, most of them forget how to lock up someone for simple offences. Why call on the DPP to lead and not the commissioner and superintendents. Why?Are they above that. They are to busy eating doughnuts and drinking coffee. Parents and relatives of these scooter rider's, the commissioner of police and his officers is responsible for your pain and suffering. The reason be , the law about unlicensed and uninsured motor scooters and motor Vehicles is as clear as day but the people responsible for enforcing the laws of the virgin islands are not doing so. If they were enforcing the laws you would not be in such pain and agony.The politicians are quick to say how much they feel your pain but with that same mouth they would get up in the legislative council and send the message to the Police department to rid the streets of the unlicensed and uninsured motor scooters you would not be in bawling for your love ones. I would like the bloggers or anyone reading that this Police Force is one of the hardest to manage if not the hardest in this part of the hemisphere. You have so much chief and not much Indians.. It's too heavy.I really don't like to be negative about the police force but they are the ones responsible for enforcing the laws when it comes to unlicensed and uninsured road users. What is the reason or reasons for not enforcing the laws on this particular issue , when so many families are grieving.Are you afraid to do your job because of some politicians. If that's the case write to the Governor. The police welfare can do that if it still exist.This is not a matter of a fowl fight and a cook died ,it's human lives being destroyed and the authorities just sit back and say how much money it is costing to look after them at pebbles Hospital. Please do something and do the proper and right thing rid the streets of the unlicensed and uninsured motor scooters.And make sure the rider's have a valid licence. This is what it takes for young people to listen--- for them to get mash-up. They don't listen to mother, they don't listen to father, they don't listen to teacher, they don't listen to Police, they don't listen to love ones. This is the only how God can get them to listen.. Many you sit here and blame the police and government for these bikes that have no license.Tell me how easy is it to catch a guy on a bike in traffic?When was the last time any of you pass by the police station in town and have seen all the bikes that they picked up over the past year? Remember a bike has two wheels and a police vehicle has four and also much wider, by the time people in traffic hears the sirens and move out of the way the bikeman done squeeze through and gone.So who is going to tell the police where the bikeman he was chasing went?We have an amazing ability to keep our mouths shut.It's by luck and chance most of the times that the police catch some of these guys with these unlicensed bikes.We need to be more proactive that reactive.Instead of criticizing,do something to help catch these guys and take them and their unlicensed bikes off the roads cause a lot of them do some crazy things in traffic. some of these scooter riders are putting people's lives in extreme danger. There are 100 plus nationalities residing in the BVI. However, the daily scooter nonsense is attributed to young Black males. Why would this be seen as a failure of the Police and the Government? Seems to me that these boys are suffering from an enslaved mentality lacking in self worth. Ayo think police always dumb. Two got fired for chasing them. They have family to feed.so if they don't hear the good feel. You pay me salary, I will get a dump truck and a mini crane and go around the Island and remove the scooters and burn them. Living off experience not wearing a helmet makes you look cool but when u crash without wearing a helmet it makes you look like a fool. These toys are the cheapest mode of transportation for those who cannot afford to buy a car. Many places all over the world use this mode of transport. . They are not well made, don't last long before needing parts and repairs, and are not as safe as the larger cycles, say 250-500ccs. Or the mopeds in Asian countries and Bermuda. It works in those areas with much larger populations. Why not here. Definitely sounds like the drivers. Amazing the customs department is where all the bikes go through. Measures can and would have to be put in place to control the importation. You government cannot continue to allow the importation when all fully well know that they are not being licenced and insured. This problem started a few years now and not much has been done about it. Well amazing if the police cannot get these scooters which is in the hundreds how the hell are they going to catch a few criminals on foot. Let me tell you this if the police really want to get the unlicensed and uninsured off the road it don't need any rocket scientists to do it. The police force consists of bloggers like you and I. They very smart and clever officers.So you really think they have to be out there in there four wheel Vehicles Looking for bikes on two wheels. What are you really chatting.The bikes in the east end area some of them ride right in the police station. And no helmet allows anyone to ride any motor engine on the public road without a license and Insurance. I guarantee you if the politicians open there mouth and send the message to the Police to rid the streets of the unlicensed and uninsured motor scooters you would see a big difference but instead they would talk about how the dead ones would be remembered. Lol.And the bvi may have a hundred different nationalities but majority a black people. I am not against bike but they must be licenced and insured. You know what personally I don,t give a @#%# about those drag up youth on them stupid scooter.There attitude comes from them shameless parents who allow them to act so.That's why nobody,biv,expat want them in them work place,Their outcasts that will all eventually kill themselves....adios.